Recommended 20 – 50 LPM. Includes 2.2m hoses, flat face couplers, slide frame & linkage. Australian manufactured. Heavy duty auger drive unit to suit Wheel Loaders. 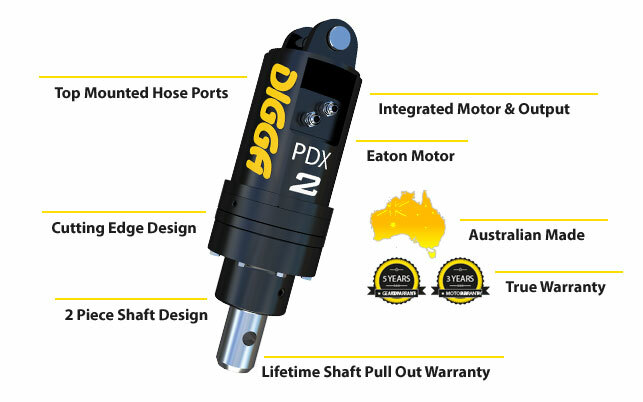 Digga’s PDD to PD4 range of drilling auger drive units and earth drills are ideally suited for micro excavators and small wheel loaders with a flow between 15 to 85 lpm. Ideally used for drilling holes for fencing, tree planting, house foundations, and more. Innovative design allows the gearbox to go down the hole to maximise drilling depth without extentions, eliminating downtime and minimises maintenance, optimising your returns. Digga planetary auger drives are fitted with Digga / Eaton bell motors specially designed for drilling and augering in most ground conditions. 2.2m hydraulic hoses & flat face couplers. Let us know your wheel loader at time of order and frame will be supplied to suit.